Emanuel A. Petersen (b. 1894, d. 1948). Greenlandic landscape. Oil on canvas. Signed: EmAP for Emanuel A. Petersen. 1930 s. In very good condition. The canvas measures: 47 cm x 24 cm. The frame measures: 2,5 cm. Oil on canvas. Winter mountain landscape, 1939. In very good condition. Indistinctly signed: C. Faber. Measures: (ex. the frame) 42 x 32 cm. The frame measures 3 cm. Scandinavian modernist. Colorful landscape. Oil on canvas, 1964. Signed: SL-64 Measures: 54 cm x 45 cm. The frame measures: 6 cm. In very good condition. Depicting two figures—likely a milkmaid and footman—on a Hillside overlooking a French country Chateau. Unsigned. 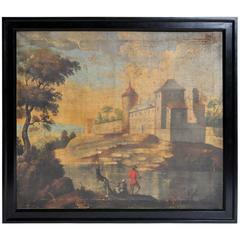 Depicting a lake and figures in landscape. 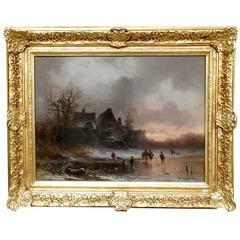 Giltwood frame. Relined. 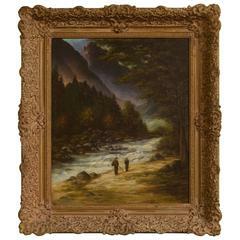 A mountainous river landscape with two figures in the foreground. Oil on canvas. Signed 'A. Hoffman', circa 1870. 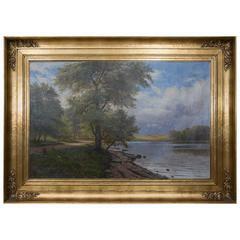 Beautiful large oil on canvas of a tranquil river valley and fisherman. Could be the Hudson Valley. Signed lower left, A Forcella. 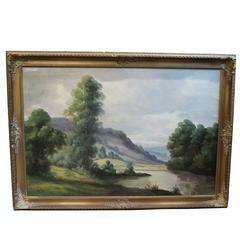 Beautiful oil on canvas landscape in antique gold frame.